In this article, we will learn about how to handle conditional validation in our model-driven form using the latest forms module. 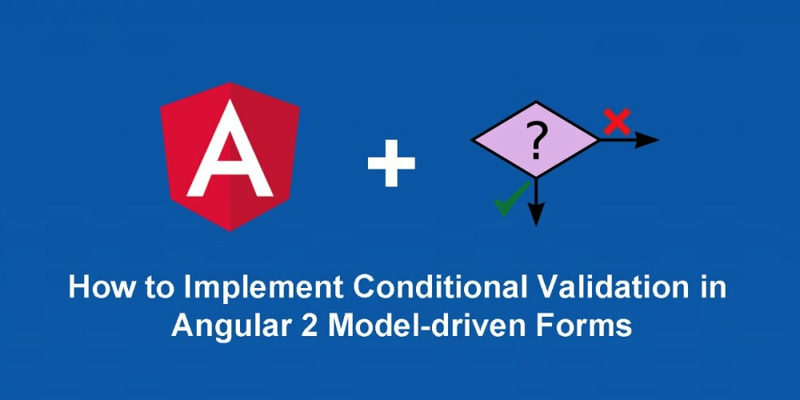 If you are new to Angular 2 model-driven forms, please refer to Using Angular 2&apos;s Model-Driven Forms to get to know the basics. We will build a form to capture a customer payment method based on this interface. A customer must select either bank or card type. Set default payment method type to bank. All the bank fields are mandatory when bank is selected. All the card fields are mandatory when card is selected. Show error message when the field is invalid. As of RC.2 - RC.4, deprecated forms is enabled by default. In order to use new forms module, we need to npm install @angular/forms npm package and import the reactive forms module in application module. Let&apos;s move on to create our app component. FormBuilder as its given name, we use this to build our form. Validators contains all the default validators (e.g. required, minlength, etc) that Angular provide us. FormGroup. All the form is of type FormGroup. Therefore myForm is a of type FormGroup. We import this to strong type our form model. We defined an object PAYMENT_METHOD_TYPE to hold the payment method type information. All set! Now let&apos;s implement our model-driven form. We split our initialization to a few different functions. initPaymentMethodCardModel and initPaymentMethodBankModel will initialize the card/ bank fields&apos; value and validations. initPaymentMethodFormGroup initializes the payment method form group. We then initialize our form model in ngOnInit and assign it to myForm. When a user clicks on the * Card** or Bank button, we need to *update the payment method type field accordingly. Let&apos;s create a new function in our component. Whenever the user clicks on the ** Card** or Bank button, we will pass the selected payment method type to setPaymentMethodType. Later we will bind this in our HTML view. Let’s add all of the controls to our view. Required (Must be valid card number). Required (Must be in format MM/YY). We bind the setPaymentMethodType function to the Card and Bank button click event. Each form controls bind to input with formControlName directive and show an error message when it&apos;s invalid. Refer to Using Angular 2&apos;s Model-Driven Forms for more explanation on formGroup, formGroupName and formControlName. Now, let&apos;s implement our conditional validation function. As mentioned in Using Angular 2&apos;s Model-Driven Forms, each form control exposes the valueChanges event, which we can subscribe to. We will also subscribe to the payment method type value change event. Each time the payment method type changes, we will update our validation accordingly. Let&apos;s implement the subscribePaymentTypeChanges function. Remember we split the initPaymentMethodCardModel and initPaymentMethodBankModel to individual functions at the beginning. We can reuse the model here to retrieve the validation. FormControl exposes a function call setValidators. We will use this function to update the validation rules. Calling the setValidators DOESN&apos;T trigger any update or value change event. Therefore, we need to call updateValueAndValidity to trigger the update. For example, by default, Bank type is selected and all its fields are mandatory. If we enter values to all the bank fields, the form status will be updated to VALID. Then, we click on Card button. The form status should be updated to INVALID because we have not entered any values to card fields yet. If we did not apply updateValueAndValidity, the form status will remain as VALID because we only updated the validation rules of each field. We did not trigger any updates. Now that we have declared subscribePaymentTypeChanges() function. Let&apos;s apply it during ngOnInit() and set the default payment method type to bank. That&apos;s it. This is how we can handle conditional validation in model driven form. Happy coding!